Favero and I are eating this cobbler now. Sweet Miso is our sugar this summer. 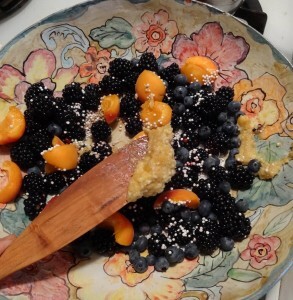 I made scones with it the other and day and now this cobbler. 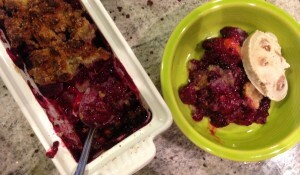 THis cobbler is as good as a blanket on a cold day. Hello! I hate to ask, but could you please translate the 8# cooked garbanzos to a dry measure? I know that this is precisely the recipe I’m looking for, but would like to feel on firmer footing with it. it sounds good. please inform how one makes / where one finds the second and fourth ingredients: rice koji and garbanzo bean miso starter miso. thanks in advance. A quick Google search yielded several results, including GEM Cultures, Cold Mountain and South River, all of which offer koji. 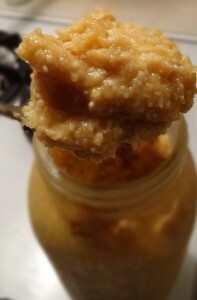 Miso starter (unpasteurized miso paste) is much easier to find than koji. GEM and South River have both available, and unpasteurized miso is often available at health food stores, or even Whole Foods. GEM cultures sells mold spores to make koji, and includes instructions to make it. Sandor Kataz’s books as well as GEM gives instructions for making koji and miso. Once you’ve made miso, you’ll have a source to use as starter miso for more batches. 7 lbs. and 6 oz. of koji. I have another question for you. I made my first Garbanzo miso this past weekend (it took me this long to manage the time). I put it in the place where I usually ferment sauerkraut, but have realized that the temperature there is running between 55F and 59F right now. Is this too cold for white miso? I can move it to a place that averages 69F if that is better, but I’m such a novice that I have no idea whether it matters or not. Please help. And thank you for all you do in this regard!! Nancy, I recommend you select the higher temperature. If your intent is to make a sweet miso, higher temperatures will assist the process, and the goal. Warmer temperatures mean a faster ferment, which, for a sweet miso, means a sweeter miso faster. 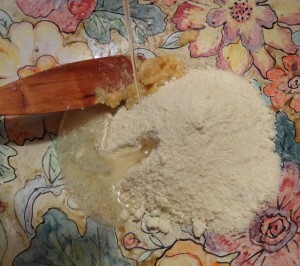 Sweet or white miso pastes have more koji per bean substrate. The enzymes in the koji convert the starches from the bean and the rick into sugars faster than the enzymes can convert the sugars into other products. So the miso is sweet because of the stockpile of sugars. Fermenting at a lower temperature will mean a slower ferment, and less build up of sugars.So the miso won’t be as sweet, but it will be delicious. So glad I asked. Thanks once again for your answer and for sharing your knowledge. I’m off to move the miso! Yes, you can use any live miso as starter for a fresh batch. I have a question to ask. How much unpasteurized miso starter do you add in this recipe? I want to make it with different beans soon, so I want to know the starter amount. Thank you in advance! Just a tablespoon or two. Taste as you go and add more if you like. Just a tablespoon or two. Taste as you go, and add more if you like.